Domain configurable units (DCUs) are the hardware building blocks of PDomains. 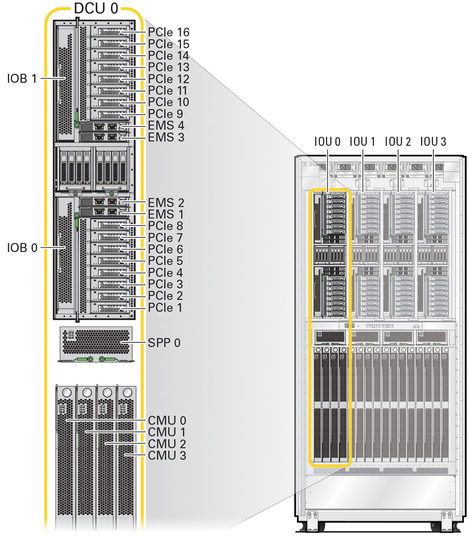 A DCU includes one IOU, which contains internal drives, network connections through the EMS modules, and 16 PCIe expansion slots. A DCU also contains 2 or 4 CMUs, and each CMU contains 2 processors and 2 memory boards. The following illustrations display the locations and components of DCUs. 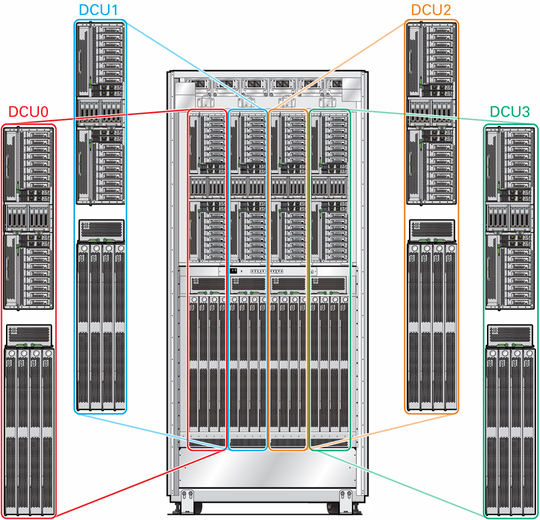 Note - Depending on the configuration you ordered, a server can contain fewer than four DCUs, and each DCU can contain less than the maximum number of CMUs, EMS modules, and drives. Contact your Oracle Sales representative for specific ordering details. A fully-populated DCU contains four CMUs, and a half-populated DCU contains two CMUs. Each DCU can contain the following components. A PDomain can contain one to four DCUs. Using Oracle ILOM commands, you can combine DCUs into PDomains. Refer to the administration guide for instructions on creating and administering PDomains.